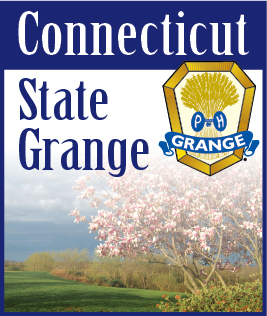 The 97th Annual North East Grange Lecturers’ Conference will be held July 30th to August 2nd at Rivier College, Nashua, New Hampshire. The theme of the conference is “Beyond The Earth”. Connecticut will present its’ program entitled “Moons” on Tuesday morning, July 31st. Our rehearsal is Monday evening after the Formal Opening and New Hampshire’s program. This year you will have a choice of dorms to stay in. The cost will vary from $220 to $260 depending on which dorm you choose. We were at Rivier College six years ago and we only heard good reports on the quality of the college and meals. This year there will be a sit-down banquet. By now everyone should have their information. If you haven’t received yours, please let me know and I will see that you get it right away. Don’t forget that the deadline for registration is July 10th. This will be strictly enforced. Please note that the conference is one week earlier than usual due to scheduling problems at the college. I am still looking for numbers and ideas for our program on the Moons. If you have something, or an idea of something we can do, please contact me. Please also note that next year Connecticut will host the conference. I am looking for a reasonably priced, appropriate place to hold the conference. If you have a suggestion please let me know. Let’s all work together to make the conference a success. I have received all the information on Lecturers’ Conference and as soon as I get this newsletter finished, printed, and mailed I will attack the info for Lecturers’ Conference. You should have it within the next week. Besure and read the letter carefully about the rooms. You have several choices this year and the cost will vary from $220 to $260 depending on which dorm you choose. The theme of the conference is “Beyond The Earth”. Connecticut will present its’ program entitled “Moons” on Tuesday morning, July 31st. Our rehearsal is Monday evening after Formal Opening and New Hampshire’s program.